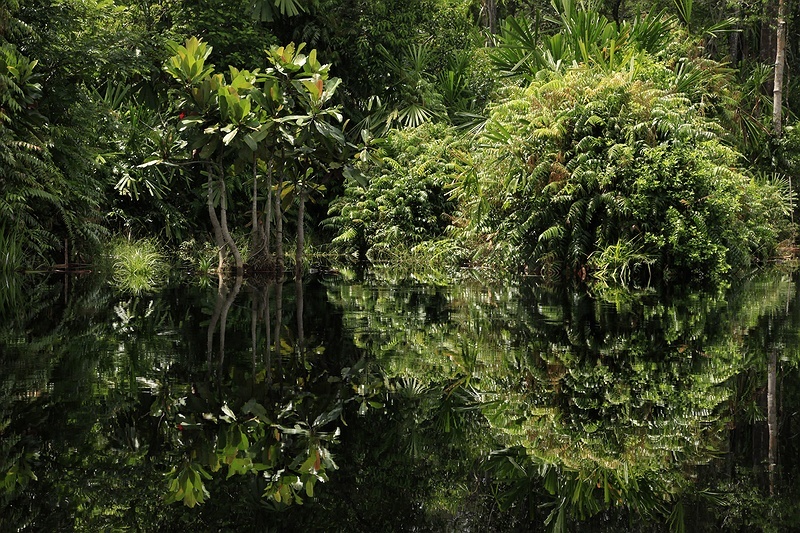 The scale of destruction is reflected in the dark waters of rivers, streams and lakes in the peatland rainforest. Sumatran resident Pak Dani Jambang in the village of Teluk Meranti has noted a 70 percent drop in his fish catch since 1998. "Before they started logging here we caught about 100 kilos per month. Now it is between 30 and 40, if we are lucky," he says. As the land is burned and drained huge amounts of nutrients are flushed into the surrounding area. Deforestation at a local level shows how quickly the forest floor is being cleared. Communities have experienced a clear decline in fish catch as the acidification of water ways increases. Moving at 15 kilometres per hour in the fisherman's 'pompong', a narrow noisy wooden boat that beats out its title; popular for its reliability and cheap running costs, we head deeper into the forest. The river narrows, the visibility drops and the air intensifies with oxygen oozing from the jungle. In some places the river is so narrow from the over spilling forest density that it becomes a battle to stay in the boat. Long spiky arms of foliage reach in, grabbing passengers while shedding a plethora of unusual insect hitch-hikers. "Today, we don’t get any fish at all some days. The situation could hardly be worse. We are becoming poorer and sometimes I feel there is no future for my family." With a grave face Pak Dani Jambang crosses the long, narrow boat onto the floating platform of his fishing cottage. Emblazoned in bright yellow letters the word Pelangi is daubed on the side of his hut. "It means rainbow," he says after a pause. "As young man I worked in Malaysia for seven years on various palm oil and rubber plantations. I passed a nice hotel called Pelangi on my trip there once, it was always my dream to stay there, if I ever had the money." His otherwise serious face bursts into a big smile. "Yes, I have been working in the destructive business too, we all make mistakes. The forest is important for all on the planet, but for us here it is vital for our survival. I will need the wood for my funeral casket," he quips.